You are here: Don't Waste The Crumbs » Real Food 101 » What’s the difference between all those types of milk in the grocery store? 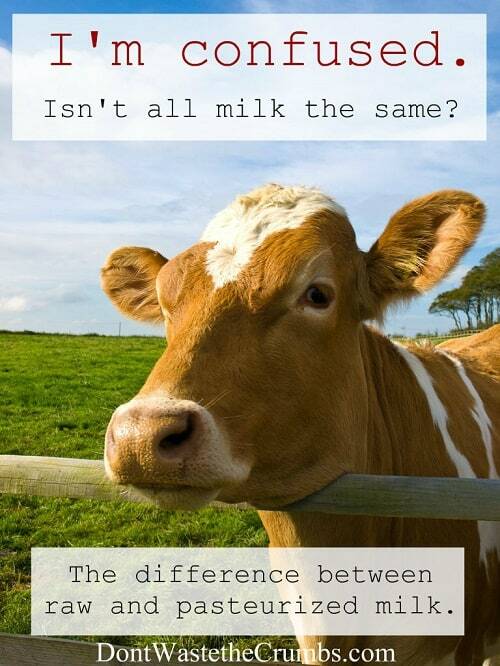 Have you ever wondered what the difference was between all those different milks in the grocery store cooler? I have, and I can’t possibly be alone. In fact, I know I’m not alone. A friend of mine gave me a quizzical look when I started talking about unhomogenized milk. Not everyone knows that grocery store milks are pasteurized, let alone pasteurized to different levels. And what about fortification – do we get a say in that too? My friends, meandering the ins and outs of milk is VERY confusing. Part of the mission of Crumbs is to educate ourselves on what food actually is and what the labels mean, so that’s precisely the point of today’s post. This is actually just part of the iceberg. It’s more than the tip, but certainly not everything I want to share on grocery store milks. There’s SO much I want to share and give due diligence to research for you guys just in terms of milk… hormones, pesticides, organic vs. conventional, homogenization, lactose, casein, powdered milk… and the more I research the more I want to write! So we’ll take baby steps with dairy and cover these topics (and SO much more!) one at a time. There are two broad categories of milk: Raw and Pasteurized. That’s quite a list, don’t you think? The only way to really get the full benefits of these nutrients, and the enzymes that help us assimilate them all, is buy consuming raw milk. Pasteurized milk is everything else. If it’s not raw, it’s pasteurized. According to the Real California Milk website, “Pasteurization is the process of heating milk to destroy disease-causing microorganisms and to increase shelf life.” It’s also the same process that kills most of the awesome nutrients and enzymes in the milk. In fact, most of the original vitamins have been reduced so low, that they’re virtually negligible on a nutritional label. Curious why pasteurization evolved in the first place? Read THIS post. Milk can be pasteurized to three different levels: Ultra-High Temp (UHT), High-Temperature Short-Time (HTST) and Low-Temp. UHT milk is heated to a temperature higher than 275°F for more than two seconds. This is the milk you find in aseptic (cardboard) containers. Non-refrigerated, shelf-stable milk is definitely UHT. Refrigerated milk may or may not be UHT. The refrigerated coolers have both cardboard and aseptic containers, so make sure you read the labels first. HTST milk is heated to 162°F for at least 15 seconds. This is the most common method of pasteurization used in the dairy industry. Because all grocery store milks are pasteurized, they are fortified to compensate for the loss of nutrients. That huge list of awesome vitamins and minerals up there? Most of those nutrients are non-existent in the pasteurized milk found in grocery stores. The loss of calcium and phosphorus is about 5%. Thiamin and Vitamin B12 go down by 10% and 20% of Vitamin C is lost. The high heat used in the process kills healthy bacteria and enzymes and damages the remaining nutrients so that our bodies do not benefit from them. Dairy manufacturers know this, as do food scientists, so milk sold in grocery stores is fortified with synthetic nutrients that our bodies treat as foreign chemicals. The FDA regulates some of the fortification process, but not all. For example, federal law mandates that manufacturers add vitamin A and vitamin D. Some manufacturers go beyond this requirement and add some of the other nutrients lost during the process. Regardless of what vitamins are added though, they’re all fake. From a nutritional standpoint, raw milk is best. If you don’t have access to raw milk, aren’t quite ready to make that leap yet or don’t have room in the grocery budget for raw milk, the next best option would be low-temp milk, followed by HTST. Personally, I would never recommend drinking UHT milk. It looks like milk, tastes like milk, but does NOT do your body good. There very little original nutrients left, if any, and it’s pumped with a variety of fake ones that put your body into a whirlwind while trying to digest them. Quite honestly, if I were given the choice between UHT milk or no milk, I’d choose no milk. If you’re looking for better options, look up how to make milk alternatives at home. You can find the SIX different milk alternative tutorials on the dairy series homepage HERE. But the milk we’re talking about is conventional milk, right? Where does organic fit into the mix? Isn’t that pasteurized? And if so, is it really any better? That post is next! Do you have your head wrapped around milk? What aspect do you find most confusing? I am starting to learn more about the differences between UHT and HTST, which has been pretty scary learning about this for the first time. But as I am researching, it seems like many are saying there are negligible differences of mineral loss between raw milk and htst and uht as well. I don’t know who to believe! I am thinking of going with good old organic HTST. Its not so much the vitamin part that worries me, because you can get vitamins from plenty of different foods, its moreso the enzyme loss. I would also be interested in some sources. The claim that the vitamin levels are extremely changed as well as how grocery stores is fortified with synthetic nutrients that our bodies treat as foreign chemicals need to be backed up. What are your sources for how our body treats fortified foods? I mean I know from your blog you take collagen for instance, how is that processed supplement any better than vitamin D in milk? I think that this article is very interesting. As a student at the University of Georgia getting two Bachelor of Science degrees in Animal science and Dairy Science, I am just wondering why you don’t discuss any of the issues with drinking raw milk? When looking at scientifically backed researched (such as research done by the FDA and the USDA) you find that the nutrient differences between pasteurized milk and raw milk is almost negligible. You quote that milk is pasteurized in order to kill bacteria, and that is true. Raw milk contains bacteria that can cause food borne illnesses, and it contains those bacterials no matter how clean/healthy your cows are, how sanitary your milking conditions are, or how carefully you handle the milk. Before pasteurization became required by law, milk products were responsible for over 25% of food borne illnesses in the US, now that we pasteurize milk that percentage has dropped to lower than 1%. Drinking raw milk is a choice people have the right to make, but I think that if you are going to discuss the “nutritional” benefits of different types of milk you should not exclude the overall health benefits and issues. Drinking raw milk is a gamble, and it is a very dangerous gamble when you are talking about immunocompromised individual and young children. What people eat is their choice, but if you are going to tell a story you should tell both sides. Can I ask what you believe to be dangerous about pasteurisation? It’s one thing to prefer non-pasteurised but what makes you call it unsafe? I grew up on a small farm in rural Wisconsin. I have 6 siblings (a large family 🙂 ) We drank raw goats milk from a young age, we were fairly self sustaining with veggies and our own pigs/ cattle for meat. We did not contract any sort of illness aside from common colds. YET, I am compelled to question the generalizations mad in your article, and with no mention of sickness and miscarriages throughout the decades, centuries linked to raw milk. When I read your article and your sources they do not hold as much weight as the CDC’s epidemiological studies on the out breaks of Campylobacter spp. tracked and corresponding directly with the rise in sales of raw milk. I will link CDC here > https://wwwnc.cdc.gov/eid/article/21/1/14-0447_article https://www.healthline.com/nutrition/drinking-raw-milk#Claimed-Benefits. Anyways. I think science should come first. Double blind well researched.. without the hands of lobbyists. Is that a thing? Do double blind studies w/o the hands of lobbyists (or big pharma or big ag) exist? I don’t think so. I don’t think the CDC is intentionally out to harm us, but I do think that most government organizations aren’t forthcoming in the truth and will do what’s in the best interest of their pocketbooks. The reason there’s no mention of raw milk being linked to sickness and miscarriages is because I don’t believe that to be the honest truth. The actually function for pasteurization is to kill harmful bacteria and pathogens. Thus it is actually quite important to food technologies to serve safe quality of food to community.although the pasteurization have killed some of the natural nutrients, it helps the food to last a bit longer..this is from my opinion atleast.none of the article u have written are completely wrong actually.hhuhuhu.but do take this as consideration if making choices.thanksss! Can you cite sources other than this website please. This website has no accountability like the FDA does and isn’t credible like the FDA. Saying that pasteurized milk is better or worse is an opinion. I just want the facts. Also where is your proof that pasteurized milk is dangerous. That’s quite a bold claim. Thank you, and no disrespect intended. I’m just critical about everything I read. Chase – no offense taken. Sources are cited on this page, and if you click to the articles I referenced, there are additional sources cited there as well. Personally, given the research I’ve done, I don’t put much trust in the FDA. Oh okay I will definitely take a look into those articles. Thank you sharing all of this information. Want to know a bit more it raw milk is safe for 1 year old or not. And if i boil rae milk at home at low temperature for 30 seconds will it be safe from all the bad microorganisms for my little one?